"Below she caught glimpses of misty plains and valleys with mountain peaks rising far away. And at her feet a ravening circle of small, slavering, blind things leaped with clashing teeth. They were obscene and hard to distinguish against the darkness of the hillside, and the noise they made was revolting. Her sword swung up of itself, almost, and slashed furiously at the little dark horrors leaping up around her legs. They died squashily, splattering her bare thighs with unpleasantness, and after a few had gone silent under the blade the rest fled into the dark with quick, frightened pantings, their feet making a queer splashing noise on the stones." she would collapse into screaming hysteria." This coming Saturday is C.L. Moore's birthday and to celebrate, next Monday, I'll be posting an monster from her psychedelic short story The Black God's Kiss. C.L. Moore was born in Indianapolis, Indiana in 1911. She dropped out of college to get a job as a secretary to help her family during the Great Depression. 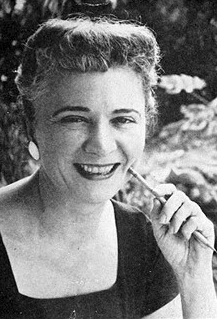 Around this time she started writing and had stories published in Weird Tales and Astounding Fiction. Supposedly, her story Shambleau was so well received by Weird Tales editor Farnsworth Wright, that he gave the entire staff the day off. Whether or not this is true, it speaks to the power of her writing. People loved it. She's probably most well know for her character Jirel of Joirey, a Medieval French woman who's defining characteristic is her unrelenting rage. Jirel goes on some really trippy adventures to strange dimensions and meets some really disgusting monsters! Moore went by the more ambiguous "C.L." because she was well aware of the fact that male writers were paid more than female writers. She may have even had a harder time getting her work read at all if she hadn't done this. Most readers didn't know that Moore was a woman, including fellow weird fiction author Henry Kuttner. He wrote her a fan letter and later, struck up a romantic relationship. They frequently collaborated using their own names as well as multiple pseudonyms. They collaborated on the story Mimsy Were the Borogoves which was later turned into the movie The Last Mimsy. She was also part of the "famous" round robin story The Challenge From Beyond which featured H.P. Lovecraft, Robert E. Howard, Frank Belknap Long and A. Merritt. Moore's work is pretty unappreciated but you should check it out if you get the chance. She's not only a pioneer of female sci fi authors but sci fi and weird fiction in general. "The thing that pursued the fleeing girl was neither man nor beast. In form it was like a bird, but such a bird as the rest of the world had not seen for many an age. Some twelve feet high it towered, and its evil head with the wicked red eyes and cruel curved beak was as big as a horse's head. The long arched neck was thicker than a man's thigh and the huge taloned feet could have gripped the fleeing woman as an eagle grips a sparrow." "The mighty blade sheared through one of the tree-like legs below the knee, and with an abhorrent screech, the monster sank on its side, flapping its short heavy wings wildly. Turlogh drove the back-spike of his ax between the glaring red eyes and the gigantic bird kicked convulsively and lay still." "And we shall see if the god Gol-goroth shall stand against the sword that cut Groth-golka's leg from under him. Now hew the head from this carcass that the people may know you have overcome the bird-god." 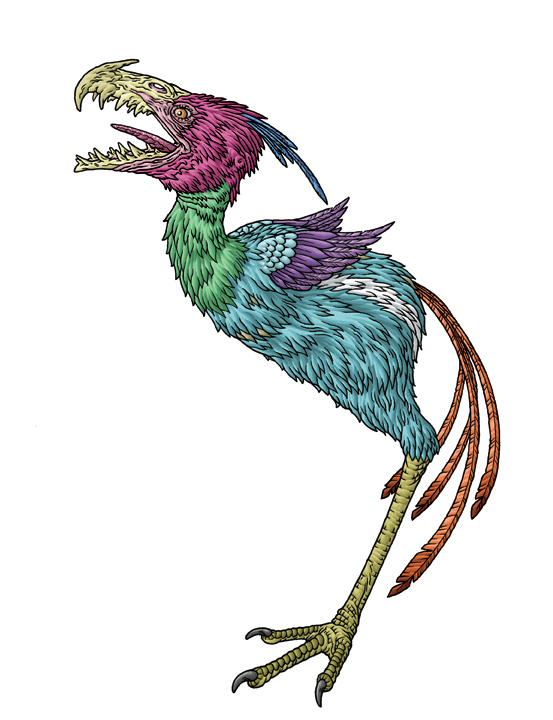 "I stared at the weird, stylized profile figure of a monstrous thing like a hideous bird with weird staring eyes and gaping beak filled with fangs. There was a stark ugliness to the depiction that was quite unsettling. "I looked up at him, a mute question in my eyes. "The moon was hidden by black, flapping shapes that circled and swooped like enormous fishing-birds, darting down to the altars to pluck and tear at the wriggling bodies bound there...and one of the huge, queerly deformed-looking bird-things emerged into the moonlight, and I stared with unbelieving horror at its hulking, horribly quasi-avian form, clothed with scales not feathers...one glimpse of the repulsive thing with its one leg and glaring Cyclopean eye and hideous, hooked, fang-lined beak-"
"It resembles a tremendous bird with one foot and one eye, and dwells under the mountain Antarktos, somewhere near the South Pole." *There are some contradictory descriptions of Groth-Golka. 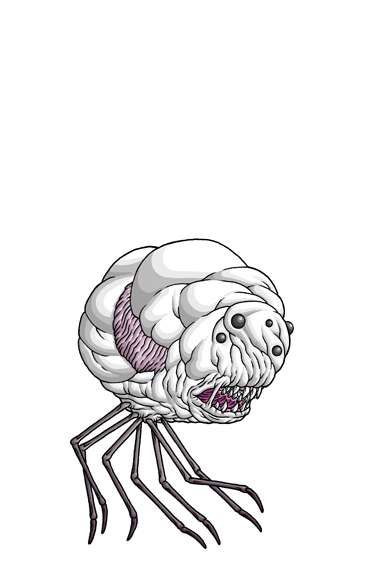 Specifically, how many eyes and legs it has. I think this was originally a confusion with Howard's quote about the man that "cut the leg from under him". It appears that in Howard's story Groth-Golka had two legs and Turlogh cut off ONE of them. Lin Carter also added to the confusion by describing the servitors of Groth-Golka (the Fishers From the Outside) as being one legged. While it does seem that Howard intending Groth-Golka to have two legs, I think one leg looks way stranger and more alien, so I kept that aspect. 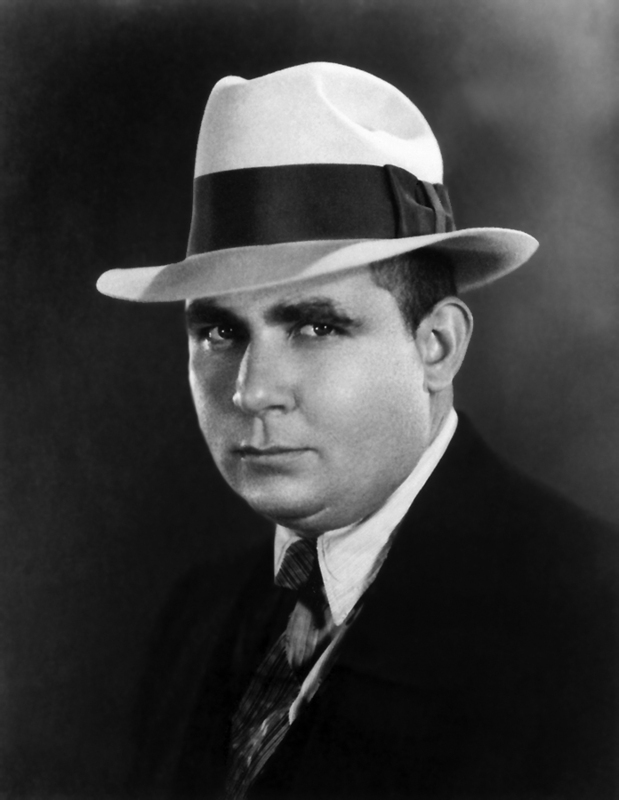 Tomorrow is Robert E. Howard's birthday and to celebrate I'll be posting a picture of a monster from his creepy adventure tale The Gods Of Bal-Sagoth. Probably the most famous of the Weird Tales "Big Three", Howard is most well known for creating Conan the Barbarian and helping to invent the Sword and Sorcery genre in literature. As if that wasn't enough he also created the enduring characters of Solomon Kane, Kull the Conqueror, Dark Agnes and Bran Mak Morn. he tragically decided to end his own life. Howard's mark on weird fiction and pop culture is undeniable. He may not have enjoyed life, but he sure knew how to write about it. the ceaseless dripping of the globules." 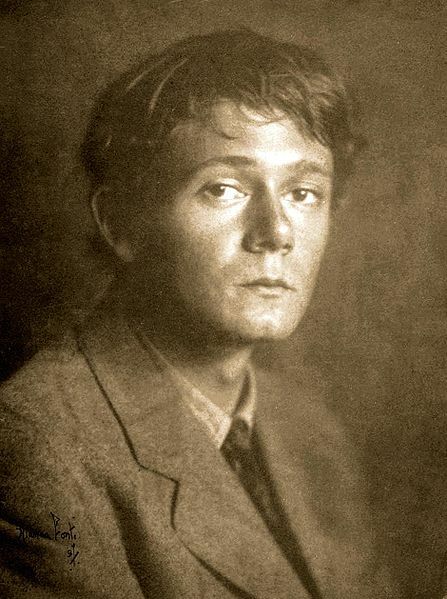 This Tuesday is Clark Ashton Smith's birthday. 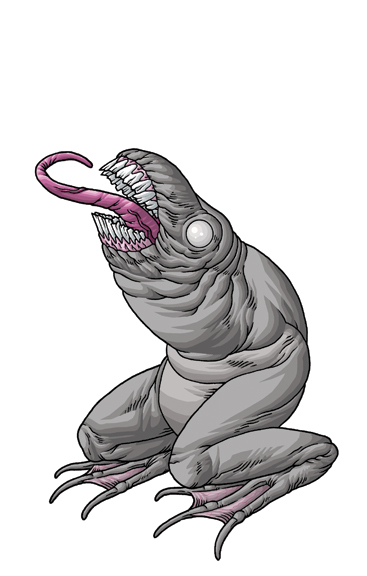 To celebrate, I'll be posting a creature from his truly weird story The Coming Of the White Worm. Smith was a sculptor, painter, poet and the most under appreciated of the the Big Three. He wrote some of my favorite weird tales of all time (The Empire Of the Necromancers, The Master Of Crabs, The Colossus Of Ylourgne, Mother Of Toads, The Testament Of Athammaus) and managed to infuse a sense of sensuality and beauty that's not as apparent in HPL or REH. In another weird tale you may have a monster that eventually gets killed. In a Smith story, you have a man that gets killed by decapitation and comes back monstrous only to be decapitated again and again coming back more horrible each time. AND THEN HE EATS SOMEONE ALIVE IN A CROWDED STREET! In some other story you may have a necromancer raise the dead. In a Smith story, you have a necromancer raise the dead, employ demons to boil them down to their essentials, sculpt a GIANT corpse from said material, inhabit it, carry around 10 other necromancers on his back and DUMP MANURE ON A CHURCH! While he may not have a Conan or a Cthulhu, he concocted many things that mythos lovers will recognize. The wizard Eibon, as well as the Great Old Ones Tsathoggua and Atlach Nacha were Smith's creation. He's made a more subtle impact on pop fantasy. Mike Mignola cites The Colossus Of Ylourgne as a huge influence on Hellboy, The Return Of the Sorcerer was made into an episode of Night Gallery and The Book Of Eibon is featured in Lucio Fulci's gore epic The Beyond, and supposedly members of The Church Of Satan tried to communicate with Smith from beyond the grave! The odd part of all this, is that Smith detested writing prose and thought it a menial task for a poet. However, at the start of the Great Depression his parents fell ill and he had to start writing Sci Fi and Horror for the pulps to help out. But doing jobs he hated was part of his not new to him. His family was poor for most of his life and at times he was a fruit picker, woodcutter, well digger, typist, journalist, editor doing whatever he could to keep his family afloat. He may not have loved writing prose but I, for one, am glad that he felt he had to. His work is classic. "I had almost collided, I thought, with a metallically grey tree. Small in comparison with the average in the forest, this tree was about sixteen feet high with very thick cylindrical branches. Then I noticed that the trunk divided into two cylinders near the ground, and the lower ends of these cylinders further divided into six flat circular extensions. This might merely have been a natural distortion, and such an explanation might also have accounted for the strange arrangement of the branches in a regular circle at the apex of the trunk; but I could not reach for a natural explanation when those branches nearest me suddenly extended clutchingly in my direction, and from the top of what I had taken for a trunk rose a featureless oval, leaning towards me to show an orifice gaping at the top." "Another instrument, a box-shaped crystal emitting a scintillating petal-shaped field, was used to subdue the counterparts of that oval-headed faceless being, which apparently were a race of enslaved workers used to perform tasks requiring strength for the relatively weak insect species." 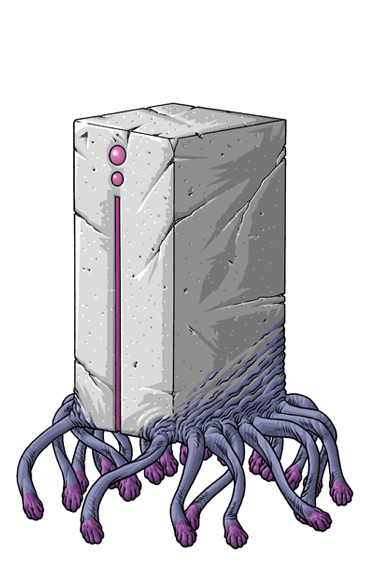 "By some obscure method of teleportation they transported the entire temple, with themselves, to the nearest planet on which they had a colony - the world of the faceless cylindrical beings, called Xiclotl by its inhabitants." "Nor did they turn in passing the cells of the Xiclotl labor force, even when the beings in them crashed themselves against the doors and extended their tentacles in helpless fury upon sensing the portions of their fellow slave." 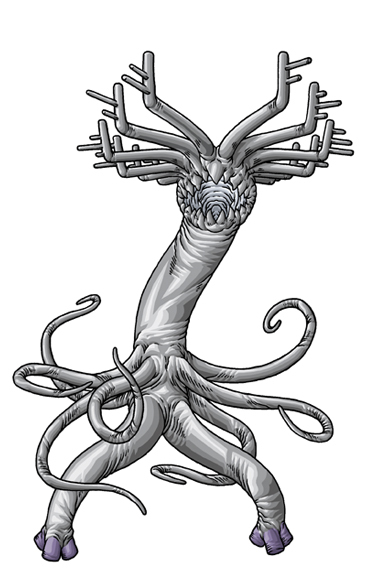 "Not until a grey metal tentacle whipped through a grille to quiver within an inch of my face did I realize that here was the passage of the Xiclotl labour force cells." 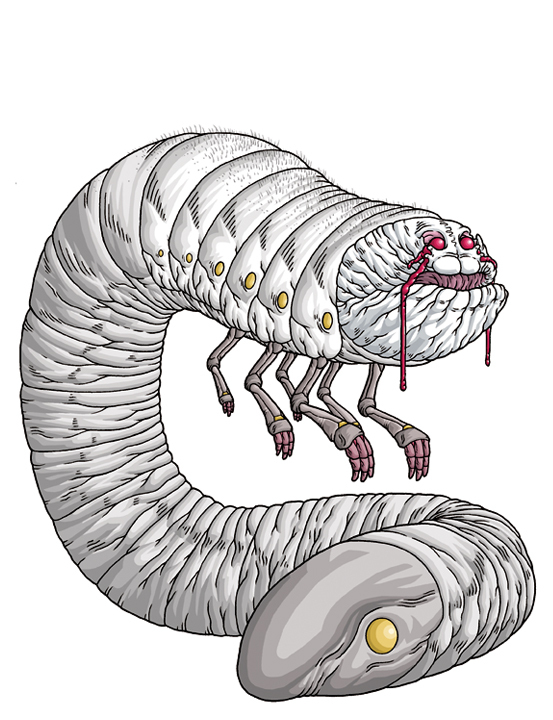 "This world became the home of the insects for many centuries, for the native race of cuboid, many-legged metal beings was not openly hostile, but allowed them to build their usual outpost with the labour of the beings from Xiclotl." "His streaming eyes bent the ceiling; he thought something small and round ran up against the roof." 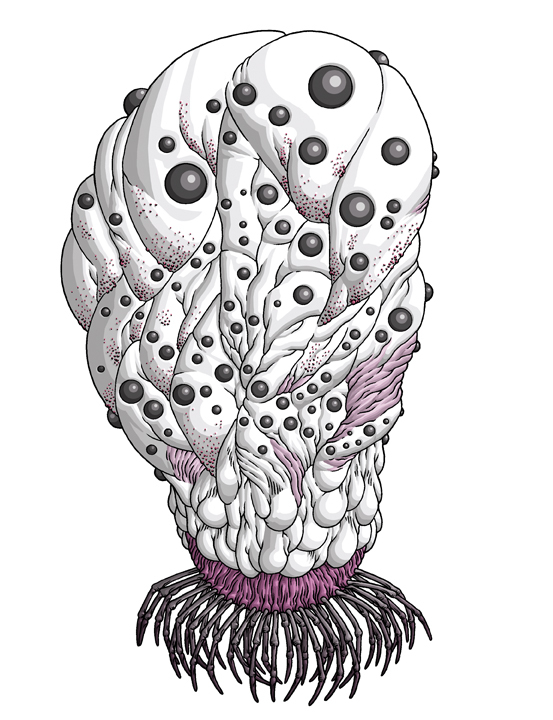 "He turned his back and saw the globular bodies dropping, rushing across the cavern towards him, biting." "Perhaps he had not seen what he spent the rest of his life trying to forget: the man's face tearing, a rent appearing from temple to jaw, opening the cheek to hand revealed; for there had been no blood - only something pale as things that had never seen the sun, something that pored down the man's body, which collapsed like a balloon. Surely Robert could not have had time to see the flood separate into moving objects that rolled away down the stairs into the depths of the building, but that was the memory he always shrank from focusing; for some instinct told him that if he ever remembered clearly what he had seen it would be something even worse than a swarm of enormous fat white spiders." "At that moment, a shadow rippled across the frosted glass: a headless man dragging something heavy." "Beyond the gulf in the subterranean night a passage leads to a wall of massive bricks, and beyond the wall rises Y'golonac to be served by the tattered eyeless figures of the dark. Long has he slept beyond the wall, and those which crawl over the bricks scuttle across his body never knowing it to be Y'golonac; but when his name is spoken or read he comes forth to be worshipped or to feed and take on the shape of the soul of those he feeds upon." "His expression was intense, as far as it could be made out; for the light moved darkness in the hollows of his face, as if the bone structure were melting visibly." "From the back of the office came a sound; Strutt spun and as he did so closed his eyes, terrified to face the source of such a sound - but when he opened them he saw why the shadow on the frosted pane yesterday had been headless, and he screamed. As the desk was thrust aside by the towering naked figure, on whose surface still hung rags of the tweed suit, Strutt's last thought was an unbelieving conviction that this was happening because he had read the Revelations; somewhere, someone had wanted this to happen to him. It wasn't playing fair, he hadn't done anything to deserve this - but before he could scream out his protest his breath was cut off, as the hands descended on his face and the wet red mouths opened in their palms." This weekend is Ramsey Campbell's birthday and to celebrate I'll be posting a drawing of a creature from his works everyday next week. Born in Liverpool, England, Campbell started writing at the age of 11. He wrote and illustrated a full book of short stories called Ghostly Tales (later published in Crypt Of Cthulhu). After this, he moved onto Lovecraftian tales and began corresponding with August Derleth. His Lovecraftian work is very juvenile but still creates a sense of urban desolation reminiscent of his later work and even Thomas Ligotti. He manages to create some truly bizarre creatures as well. Gla'ak, Eihort, Daoloth, Y'golonac are all supremely alien and "weird". He would later disavow HPL (and even later, re-embrace him) and focus on creating his own form of horror. The Face That Must Die is a grim and very personal tale of a paranoid schizophrenic set in a gritty urban environment that would come to define Campbell's work. He can turn a paper bag in a pile of trash into the deflated head of a terrifying creature or the broken glass of a window into a gaping maw. He's also really good at writing believable strong female characters that are very often his main protagonist. Often described as a horror writers horror writer he's one of the most prolific authors of his generation with over 30 novels and around 20 short story collections. And the list of awards and nominations is almost as long as the list of stories. He's won the British Fantasy Award, The World Fantasy Award, The Bram Stoker Award, British Fantasy Society Award for best novel and International Horror Guild for best novel. Some of my favorites of his work include the collections Cold Print, Dark Companions and Waking Nightmares as well as the novels Incarnate, The Face That Must Die, The Darkest Part Of the Woods, The Nameless and The Last Revelation Of Gla'aki. 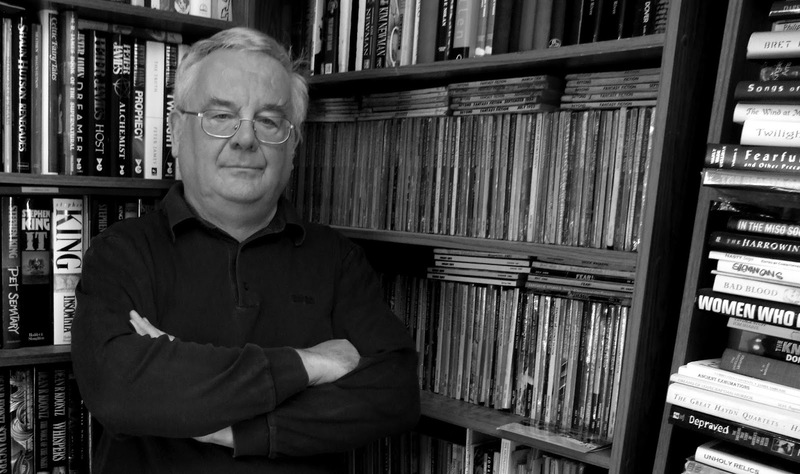 I could honestly talk about Ramsey Campbell all day. I highly recommend checking out any of his insane bibliography. You won't be disappointed. PS-Some even think Campbell is the partial inspiration for Garth Marenghi! 2015: The Year Of 100 Monsters! Hey everyone! 2014 was a great year. I did pieces for zines by both Trevor Henderson and Jenn Woodall, a Houdini/Lovecraft piece for a show in Brooklyn, I collaborated with some of my favorite authors for the Nyarlathotep project, I put out Illustro Obscurum Volumes VII & VIII as well as Collection II, an M.R. James mini zine as well as a zine by Alan Brown, I did a work for Adepticon, and a three record covers. Above is a monster round up of all 73 pieces from the past 12 months. 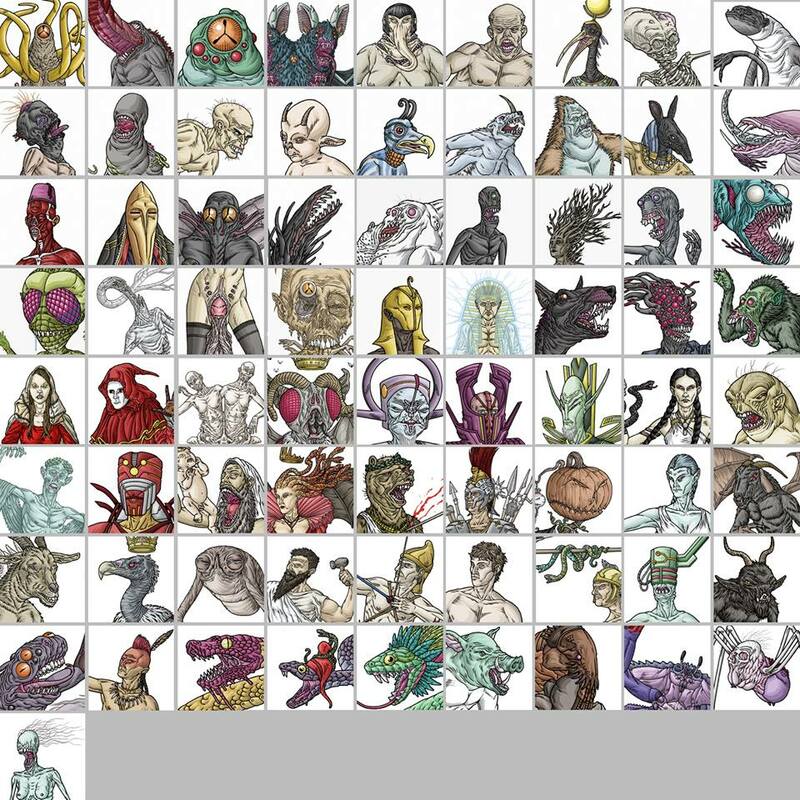 I plan on starting trying to make 2015 even better by drawing ONE HUNDRED monsters/gods. And I'm not wasting any time. 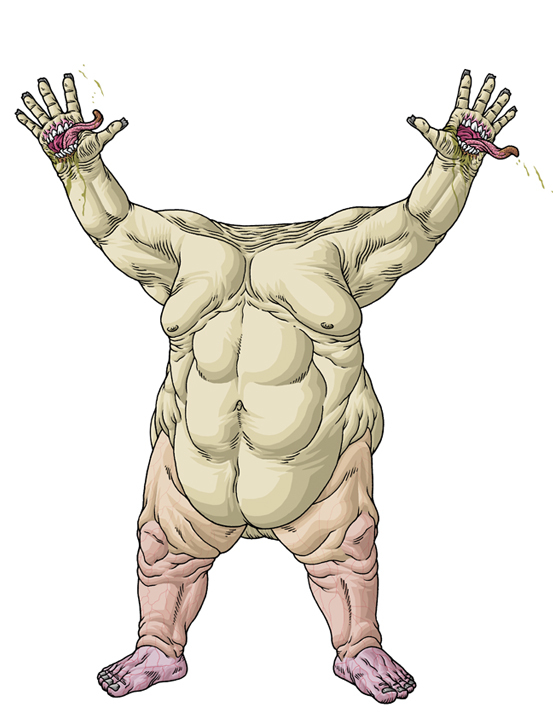 Next Monday January 5th will mark the first monster. Get ready!